I had a terrible (!) week at work this week and I came home so tired tonight that I really debated just giving up on my plan to do a Messianic Seder with the family and getting pizza but once I got home, I thought that I needed to do something positive to end this crappy week. I often find that when I try to make up a special celebration, it backfires on me (the harder I work, the less willing to humour me the kids seem to be). 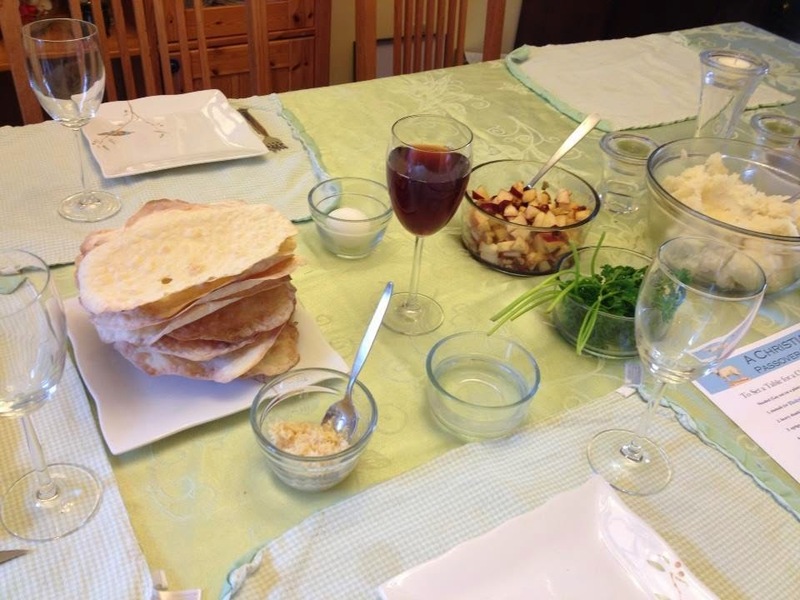 I am so grateful that I kept with the planned Seder. I followed the outline from Ann Voskamp (clink link here) and it ended up being beautiful and a memory maker for our family. I will never forget LB's face when he tasted the matzah dipped in horseradish (and I made my own matzah this year - hooray for me!) Both kids adored being allowed to drink from "real" wine glasses (although Pk did ask several times whether they were real glass or just plastic) and many toasts were done, complete with glasses clinking. The kids were interested in the story and fascinated by the change to dip the parley, drink from Elijah's cup and taste the charoset. The lamb Dh grilled was mighty tasty, too!